The lawn surrounding Bayfields used to be pasture for sheep and cattle Long before that, there is evidence that Native Americans used to hunt along these same shores. In 1921 the house was built, and later a fence was put up around the house to keep livestock from eating the missus’s flowers. In order to preserve the property for generations to come, we’re working with the DNR(Department of Natural Resources) in order to follow a forestry management plan. 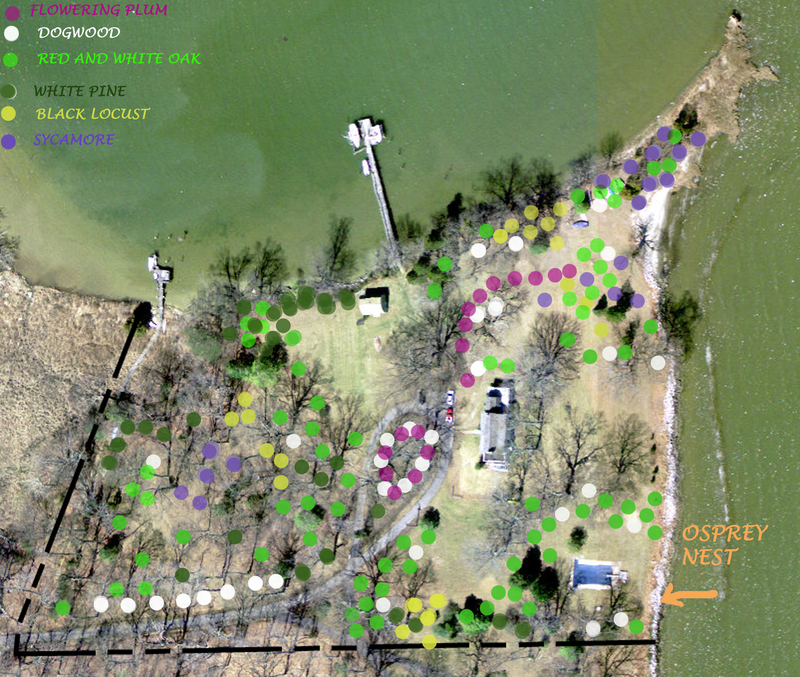 This will enable us to help sustain native wildlife and preserve our shoreline, just by reforesting some of the open lawn here at Bayfields. At the advice and recommendations of a DNR approved professional forester, we’re planting about 150 seedlings using trees native to the area. Reforestation project plans showing approximate positions of where we’ll plant seedlings. Above is a mock up of our reforestation project plans showing approximate positions of where we’ll plant seedlings. 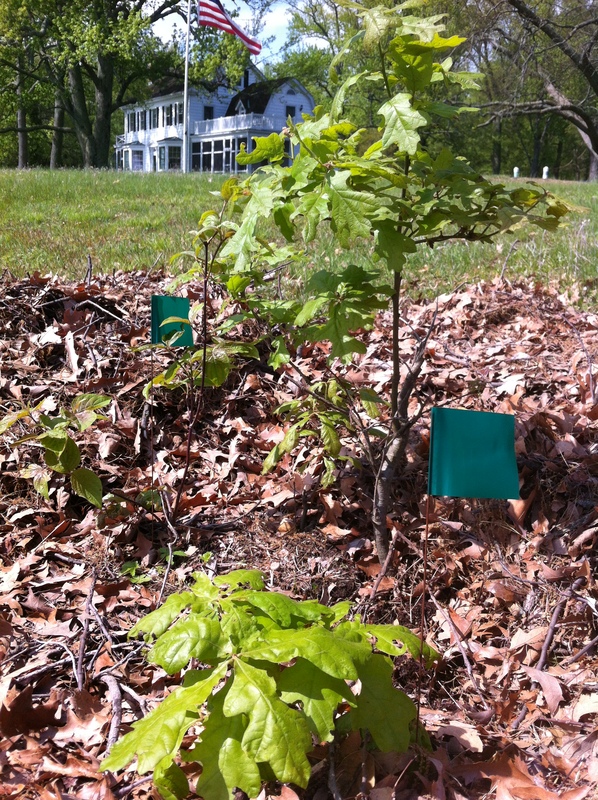 Volunteer tiny little baby oak seedling, with it’s very own flag. On your left is what often happens when I neglected to mow a patch for a while. As you can easily see, there’s already evidence of tiny trees trying to sprout. Last fall, we marked off the areas that we planned to NOT mow. This spring we’re discovering many clusters of volunteer seedlings popping up all over. It’s like an Easter egg hunt with tiny little prizes all over. As we discover new ones, we mark them with little green flags. DNR Seedlings from left to right, Sycamore, Black Locust, White Pine, Flowering Plum, and Dogwood from Jug Bay Native Plant Sale. We ordered some seedlings and saplings from the DNR; 25 sycamore, 25 flowering plum, 50 white pine, and 25 black locust. The prices were very reasonable, averaging 85 cents per seedling for a minimum order of 25. 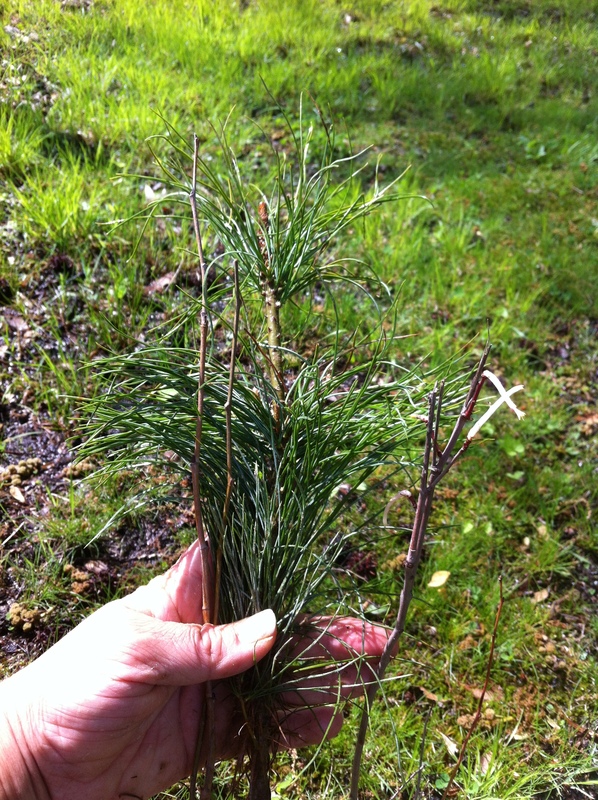 The exception were the pine saplings, which were 50 cents a piece with a minimum order of 50. I ordered late, so the beech, oak, dogwood, and redbuds were all sold out. They all came together UPS just a few days later. We had to sign an agreement that these trees would be planted in Maryland, not sold for profit, and wouldn’t be chopped down and sold as christmas trees. The bargain 500 dogwood and redbud seeds that I ordered from Amazon required much too much preparation time to have ready to plant this spring(soak, chill, scrub, scratch, soak, chill, plant), so we picked up 25 dogwood seedlings from a Jug Bay native plant sale this past weekend. Perhaps we’ll create a little grove of redbud and dogwood next door in Mom’s forest next spring. In the photo to your right, you can see a few seedlings that have gotten a 2 year head start where an old stump was difficult to mow around. There are several oaks and one dogwood. Our new forest will go from the beach to the flagpole and over beside the porch, but should be spaced far enough apart that we can stroll across the grounds and not get lost. 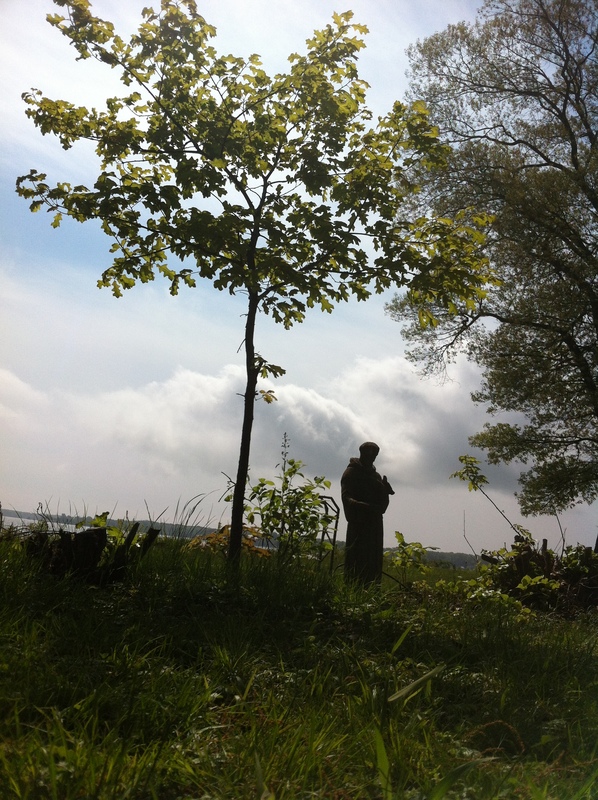 3 year volunteer oak, already showing promise of shading St. Francis yet not blocking view. 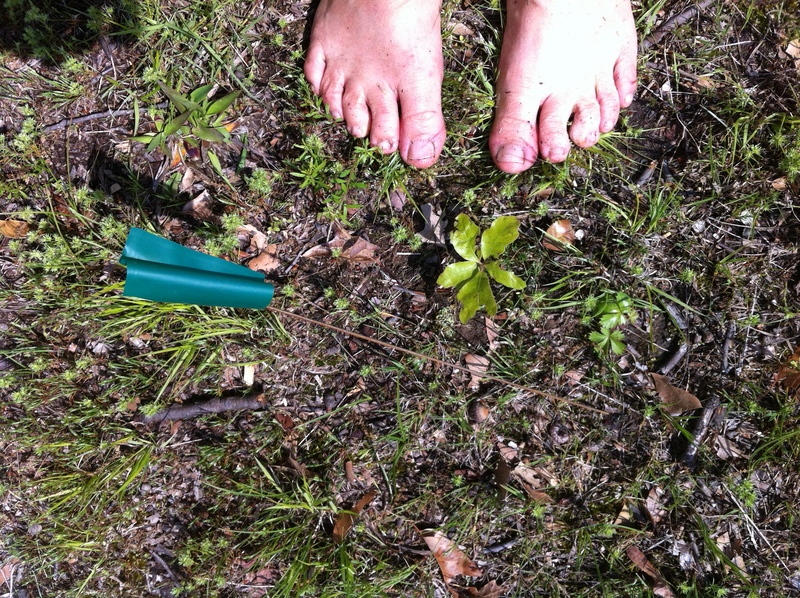 This last photo above shows a 3 year old oak seedling that I pruned the lower branches off of last year. It’s already showing promise of growing up to be a great strong shade tree. For now, it will be the protector of our grandmother’s little St. Francis statue, protector of the animals. Come stay for a weekend, I’ll hand you a shovel. You can become part of the tree planting!